I’ve been hearing a lot lately from individuals who are working hard at scenic creativity that are disappointed there is very little information toward tips on rigging and rigging hardware. Almost every scenic project requires the suspension of some sort of scenic element that echoes back scary and dangerous. Which leads me to the question that all of us ask sometime in our scenic life, why does suspension of scenery have to be so hard? It’s consistently clear that gravity always seems to demonstrate why it is the most powerful force in the universe. And if that were not enough to deal with, our funny little brain is designed to repeat whatever we’ve already done and prefer it that way, even if you’re doing things the hard way. Scenic life can be soooo stressful! Consistently invest in yourself, constantly improving your skills, techniques and knowledge of hardware accessories will make life so much easier. In addition, it can lower cost and save you time. In the past several years there have been significant improvements toward hardware. Here are a few of my favorites. 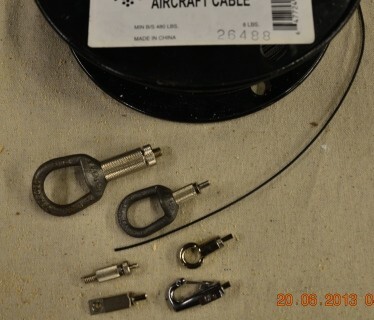 One approach that helps with the rigging challenge is with the use of gripper gliders and aircraft cable. Using the combination creates the illusion that a heavy scenic piece is freely floating, unanchored by gravity. Cable gliders and aircraft cable are designed to improve our rigging endeavors toward suspending and adjusting heights much easier. Hopefully you will see this article as beginning steps toward doing the right amount of research before doing something yourself. Skimping on hardware or not doing something proper is dumb and could kill someone. As a church we want to lead people to heaven, inadvertently, we don’t want to hand them an express ticket. Remember, safety is the most important thing.